Electronic versions provides a signal via warnings lights, an audible alarm, or the pump can be shut down. Visual versions simply have a sight tube that fills with fluid if a diaphragm breaks. 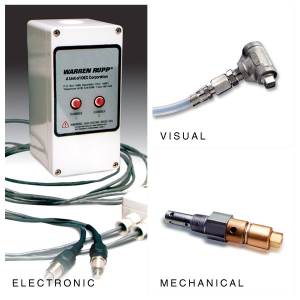 Mechanical leak detection opens an air valve, which activates a customer supplied solenoid to trigger a signal. For use with the Containment Duty Spill Containment SANDPIPER pumps only.